Wilson Carvalho was sent off as Kettering Town’s charge towards the Evo-Stik Southern League Premier Division play-off places was derailed by a 1-0 defeat to already-relegated Bedworth United at Latimer Park. 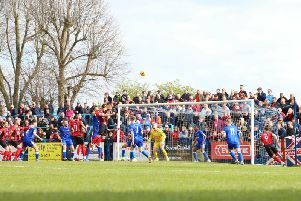 Luke Rowe’s free-kick five minutes before half-time proved decisive as the Poppies’ 11-match unbeaten run was ended in frustrating fashion. After a first half in which they lacked any sort of punch in the final third, the task was only made harder soon after the restart when Carvalho saw red for an off the ball incident. That made it an uphill struggle for the battle-worn Kettering side and they were unable to find a way through. Once again, Marcus Law made changes in a bid to keep things fresh and Gary Mulligan returned after injury but he only lasted the first half before being withdrawn at the break. Rene Howe missed out after suffering an injury in Tuesday’s draw with Leamington while Bedworth included former Poppies striker Iyseden Christie in their starting line-up. The first half proved to be something of a non-event for long spells. The Poppies enjoyed plenty of possession but struggled to find a way through a well-disciplined visiting defence. Carvalho saw a shot deflected off target with David Popa’s effort then being blocked while there was a big shout for handball against Kyle Cartwright but referee Sam Lewis remained unmoved. But Latimer Park was stunned five minutes before half-time when Bedworth took the lead. Mulligan brought down Jordan Archer and Luke Rowe stepped up to send a fine 25-yard free-kick beyond Craig Hill. A big improvement was needed but instead, the problems only increased three minutes into the second half. Carvalho had appeared to be fouled just moments before the flashpoint but then, after an off the ball incident, Mr Lewis wasted no time in producing the red card. Law reacted by throwing on Liam Bateman and Herve Pepe-N’Goma but despite plenty of huffing and puffing, the 10 men struggled to find a cutting edge in the final third. Hill saved well from Archer as Bedworth looked to kill the game off while Bateman forced Martin into a low save before he also blasted over from a Will Grocott cross. Hill made an even better stop from Jonathan Gould’s swerving effort and then the goalkeeper was in the other penalty area for a Poppies corner as they desperately hunted an equaliser. But it didn’t come, on this night it was not to be. The hunt for the play-offs is definitely not over, but Kettering can’t afford any more slip-ups, not least when they face another relegated side in Bideford on Saturday. The Poppies are going to have to do it the hard way, some things never change! Poppies: Hill; Cotton, Mulligan (sub Carruthers, h-t), Solkhon, Brighton; Grocott; Baker (sub Pepe-N’Goma, 53 mins), Stephens (sub Bateman, 53 mins), Canavan, Carvalho; Popa. Subs not used: Langdon, Obeng. Bedworth: Martin; Marsden, Cartwright, Haines (sub Kavanagh, 25 mins), Rowe; Fall, Westwood, Parrott, Gould; Archer, Christie (sub McGarrity, 78 mins). Subs not used: Donovan, Boitos. Goal: Rowe (40 mins, 0-1). Bookings: Mulligan, McGarrity (both fouls), Parrott (kicking ball away), Solkhon, Westwood (both dissent). Sending-off: Carvalho (off the ball incident).